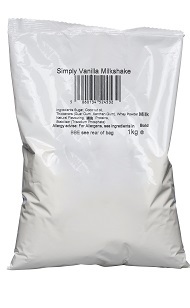 This classic product is a sweet, smooth and creamy vanilla milkshake powder will give you a refreshing summer in a glass. Easy to make ideal for cafes and brilliant for use at home if you have parties, bbq's whether its for adults or the kids. You can even add to the experience by adding other foods to it why not try vanilla and cinnamon, vanilla and summer berry or even vanilla and orange. Just add cold milk and whisk. 2 x scoops of 56g of the powder to 10oz of iced milk and stir. For different sizes it is recommended 1 part powder to 5 parts milk and stir. Sugar, Coconut Oil, Thickeners (Guar Gum, Xanthan Gum), Whey Powder (milk), Milk Proteins, Stabiliser (Trisodiun Phosphate). Store in a cool dry place, away from direct sunlight. After opening store in an airtight container. Shelf life 6 months after opening. Place 200ml (7oz) of cold milk into a jug. Add 3-4 teaspoons of milkshake powder into the jug with the milk. Wisk the contents for 30 seconds or until mixed properly. Pour straight into a cup and serve!